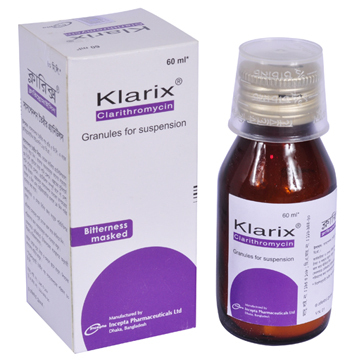 Klarix 250: Each film coated tablet contains Clarithromycin USP 250 mg.
Klarix 500: Each film coated tablet contains Clarithromycin USP 500 mg.
Klarix 60 ml granules for suspension: After reconstitution according to direction, each 5 ml suspension contains Clarithromycin USP 125 mg.
Clarithromycin is a macrolide antibiotic. It acts by inhibiting microsomal protein synthesis by binding to the 50S subunit of the bacterial ribosome. 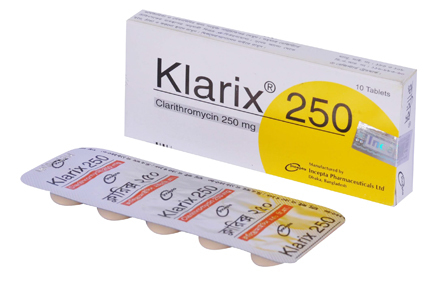 Clarithromycin is active against most gram-positive bacteria, Chlamydia, some gram-negative bacteria and Mycoplasmas. • LRTIs for example, acute and chronic bronchitis and pneumonia. • URTIs for example, sinusitis and pharyngitis. Clarithromycin may be given with or without meals. 250 mg twice daily for 7 days. Dose may be increased to 500 mg twice daily for up to 14 days in pneumonia or severe infections. Clarithromycin 500 mg (two 250 mg tablets or one 500 mg tablet) twice daily in combination with Amoxicillin 1000 mg twice daily and Omeprazole 20 mg twice daily should be continued for 10 days. The usual recommended daily dosage is 15 mg/kg in 2 divided doses for 10 days. Shake the bottle to loosen granules. Add 35 ml of boiled and cooled water with the help of the supplied cup, to the dry granules of the bottle. For ease of preparation, add water to the bottle in two proportions. Shake well after each addition until all the granules is in suspension. Note: Shake the suspension well before each use. Keep the bottle tightly closed. The reconstituted suspension should be stored in a cool and dry place, preferably in refrigerator. The most frequently reported events in adults taking Clarithromycin were diarrhoea (3%), nausea (3%), abnormal taste (3%), dyspepsia (2%), abdominal pain/discomfort (2%), headache (2%) and oral monilia. Caution should be taken in administering this antibiotic to patients with impaired hepatic and renal function. Prolonged or repeated use of Clarithromycin may result in an overgrowth of nonsusceptible bacteria or fungi. If superinfection occurs, Clarithromycin should be discontinued. Clarithromycin tablet should be stored in a cool and dry place and away from sunlight. Clarithromycin is not recommended for pregnant women. Breast milk from mothers receiving Clarithromycin should not be given to infants until treatment is completed. Clarithromycin may be used in neonates and children in appropriate doses.